There's a bold claim in the title of Matt Brown's attractive little hardback - it firmly throws down a gauntlet. It doesn't tentatively say 'Quite a lot of things some people think they know about science are wrong.' (Admittedly that would make an awful title.) It says EVERYTHING and it says YOU. 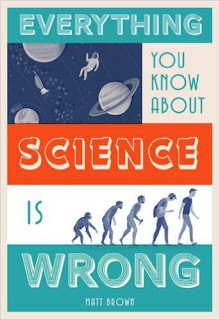 Now, I could accept 'Everything Your Aunty Knows About Science is Wrong' (though, of course, someone else's aunty could well be a scientist). But my initial reaction is for my hackles to rise - so let's see if Brown can smooth over this reaction inside. The book is a short, easy read - I got through it on a mid-length train journey. It eases us in with some misapprehensions about what scientists and science are like, taking on the stereotypes and clichés, whether it's about appearance, gender or choice of workwear in the case of scientists or always being right in the case of science. (To be fair, in my experience some of the stereotypes, such as 'more likely to be socially inept than the average population' are true, which Brown doesn't mention.) This is something the profession has been hammering on at for years, but does need repeatedly reinforcing, particularly at the school level. We then move on to a range of areas where Brown pulls apart some 'everyone knows that...' type statements on space travel, physics, chemistry, biology, earth sciences and human biology. Quite a few of them are now widely known, such as the inaccuracy of 'The Great Wall of China is the only man-made object visible from the Moon', while others, at Brown's admission, are nit-picking. So, for instance, one is 'Astronauts float in zero gravity.' If we are going to nit-pick, this is a perfectly true statement. What he really means is 'Just because astronauts float does not mean they are in zero gravity' - because, for example, the strength of the Earth's gravitational pull in orbit is still very strong, and they float on the International Space Station because they are in free fall, but missing the Earth. (If you really want to be a nit-picker, even there, because of the equivalence principle, you could describe this as zero(ish) gravity.) Other topics are likely to take even the seasoned reader of popular science by surprise. But the familiarity of some topics doesn't really matter, because they're still engaging and worth reading about, especially with Brown's chatty, informative style. As an example of one that did pleasantly surprise me, we have 'Without a heat shield, spacecraft re-entering Earth's atmosphere will burn up from friction.' I expected the nit-pick that it's perfectly possible to land slowly under rocket control if you have enough fuel - and it came. But the big reveal was that it's not friction but compression of the air that is the primary problem causing heat on re-entry, something that should, perhaps, have been obvious, but that hadn't occurred to me. So we come back to the book's title. I'll be honest, I don't like it - it feels like clickbait, like one of those headlines you see on social media that says 'Ten things you never knew about [Celebrity of your Choice]! You'll be amazed what happens next!' It can't sensibly deliver on its promise. But that doesn't stop it from being an interesting book of quirky science factoids and things that often are or used to be misrepresented. It's also nicely enough finished to be a good gift book - I can imagine it on the shelves in Urban Outfitters, say - with the one proviso that I'm not sure I can bring myself to give someone a book where the cover tells them they're ignorant. Joking apart, it's an enjoyable book that deserves to do well.